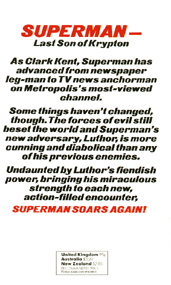 There are a few pages in the earlier British edition of Last Son of Krypton that got cut out of the American and other foreign editions. 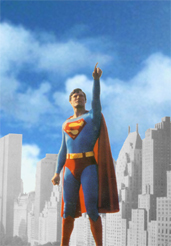 This book was marketed by Warner Books as a Superman the Movie tie-in novel, having Christopher Reeve on the cover and containing photographs from the movie, but is actually an independent story more related to the comic-book continuity. Elliot S! Maggin talks about writing the book! 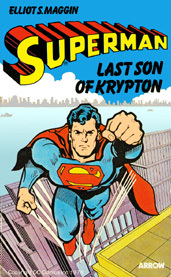 "... Last Son of Krypton started out as a treatment for a movie -- the Superman movie that I was trying to convince DC Comics needed to be made as far back as 1974. When Mario Puzo showed up at the office one day to tell me he'd gotten an assignment to write a Superman movie and would I spend a couple of days with him telling him who the character was, I was thrilled and disappointed. I spent two days with Puzo, telling stories and smoking enormous cigars, and had a fine time. Then I took my ignored little film treatment upstairs to Warner Books where a senior editor said go ahead and write a novel out of it. I did, and through a series of unlikely events, the novel was published the same day as the movie was released, and became a bestseller. "It is an independent original story unrelated to the first Superman movie with which it was released and marketed, and the only one of nine publishing products that came out with that film to make any headway in the marketplace at all. "Warner Books took it out of circulation sometime ago, going so far as to destroy several hundred thousand warehoused copies, I am told. "The book was released when I lived in New Hampshire, the day Superman: The Movie was released. I got a frantic phone call that week from the guy who was president of DC Comics saying that Alexander Salkind -- the producer of the movie -- wanted to sue me. Apparently someone had finally read him the book or something, and he thought there were too many incidents in common with the movie. I said that I had not seen the movie or read the script, but that I had handed in my manuscript a full year before Mario Puzo handed in his script, and owing to my conversations with Puzo. I told this guy where to look for proof of that, and said maybe I should sue Salkind. "Got a phone call from the guy at DC the next day saying, 'Salkind says, "Just kidding."' And that was the last I heard about it. "The book pretty much invented the super-hero novel, a sub-genre of fantasy/science fiction books that clutters up bookstore shelf space with alarming success lately. Until this year, I haven't contributed to the field since 1981. Currently I'm finishing up a new book in that sub-genre and just finalized an agreement this past week to write another one before the end of 1996." This book is available at our on-line bookshop. 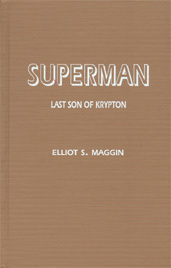 Two other Superman novels from Elliot S! Maggin are also currently available: Miracle Monday and Kingdom Come. "First published in Great Britain by Arrow Books, 1978"
First Edition: Paperback; Arrow Books, 1978 © 1978 D.C. Comics, Inc.
Second Edition: Hardcover; Warner Books, 1978 © 1978 National Periodical Publications, Inc.
Third Edition: Paperback; Warner Books, 1978 © 1978 National Periodical Publications, Inc.
Fourth Edition: Cloth; Aeonian Press, 198? (limited to 300 copies?) This was an unauthorized pirate hardcover edition with a plain brown cover. Printed by a small press on Long Island, it was available only through Books in Print up until sometime in the 1990s. It is no longer available.